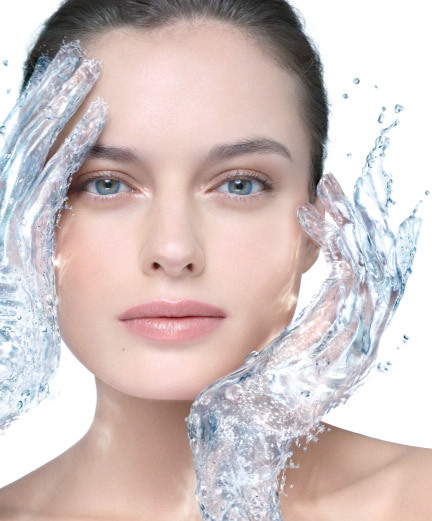 Home » Beauty Blog » “Healthy Skin is maintained by drinking enough Water??? “Healthy Skin is maintained by drinking enough Water??? Drinking water is essential for the health of our bodies and for the health of our skin. Water helps rid our body of waste by flushing out toxins through perspiration and urination; it maintains the health and proper functioning of all of our organs. It also aids in weight loss, helps our muscles stay toned and plays a very crucial role in supporting our skin. Just by looking at a person’s face, you can tell by the condition of their skin if he or she is maintaining a healthy diet, getting plenty of regular exercise and drinking enough water. Our skin reflects our inner glow and regardless of the many cleansers and creams we may use, if we don’t drink enough water – it will show up on our skin. Moisture is responsible for our skin’s sheen. The skin grows dull if the body gets dehydrated. Superficial dehydration is a common concern for many people, even for those with oily skin. You can have an oily based skin with large pores while having dehydrated cells on the surface. When these dry flakes begin to build up and are not exfoliated regularly or re-hydrated, they block the pores that are trying to excrete oil. These blocked pores can create acne, including pimples, pustules, blackheads and whiteheads. Acne, dark under eye circles, puffiness and dull dehydrated skin can all be alleviated with the proper daily intake of water. It is recommended that the average person drink a minimum of eight glasses of water a day. Alcohol, coffee, tea, and caffeine-containing beverages do not count as water. In fact, for every cup of coffee or caffeinated beverage you drink per day, it is said that you should drink an additional glass and a half of water. It is some persons that if you increase your water intake it will cause your body to retain water, but don’t be. Drinking more water will actually help rid your body of any fluid retention. When you don’t give yourself enough water each day, your body holds on to the little it has for survival, causing you to feel bloated. When you increase your intake, your body will release the stored water and normalize your system.